From a couple of years ago during my last visit to the Khutzeymateen on British Columbia’s west coast in the Great Bear Rainforest. I reworked this image for a black and white photography contest. I liked how monochrome palette highlighted the textures in the wet fur and the sedge grass. But, for me, it’s those eyes that steal the show and make the image. This entry was posted on December 14, 2018 by Christopher Martin. 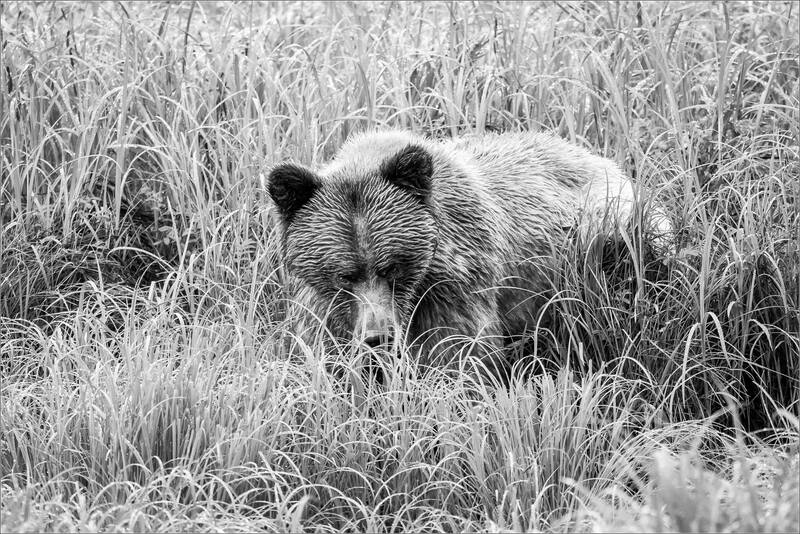 It was filed under Nature and was tagged with animals, bears, Black and White, Canada, Great Bear Rainforest, Grizzly Bear, Khutzeymateen Grizzly Bear Sanctuary, Khutzeymateen Provincial Park, nature photography, wildlife photography. I want to find out who the bears stylist is… His fur is perfect! With the perfect background of the lines created by the grass, with the bear’s fur all nicely combed, it looks like a charcoal sketch. Sometimes black and white photos can reveal things color can’t. I especially like the combination of vertical grasses and horizontally arranged bear hair on its head.